I have sailed with this mod since 1994 with no problems to date. Drill out the existing nylon pivot, remove centre plate and clean the slot and hole. You will now need a set of inside calipers and a zero to one inch micrometer. (Yes, some of us still work in the good old imperial). 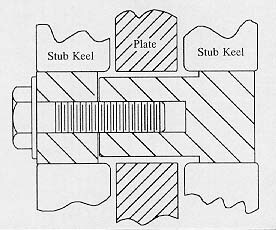 You will need to find a local machine shop that can work in stainless and have the two parts made as in this sketch. Make sure to use plenty of grease when it is all fitted together. 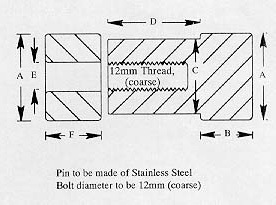 When removing the pin, replace the bolt with a length of threaded rod screwed into the pin and punch out.